Louisiana theater shooter John Houser’s hate-filled journal released. 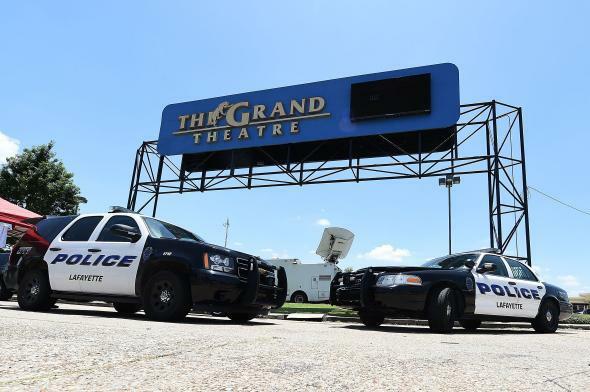 Two police cars sit near the Grand Theatre on July 24, 2015 in Lafayette, Louisiana. The hate-filled, hand-written journal of the gunman who opened fire in a Lafayette, Louisiana movie theater over the summer was released on Wednesday. The 40-page journal doesn’t explain the motives of 59-year-old drifter John Russell Houser, but it does further reveal the distorted thinking of a mentally unstable man who openly praised white supremacist Dylann Roof, the mass murderer who shot and killed nine churchgoers in Charleston, South Carolina just a month before Houser’s deadly shooting spree. Hauser killed two people and wounded nine more during a July showing of the movie Trainwreck, before killing himself. “[Investigators] determined that Houser entered the theater with a handgun hidden in his pants, and waited several minutes before pulling it out and opening fire,” according to the Associated Press.